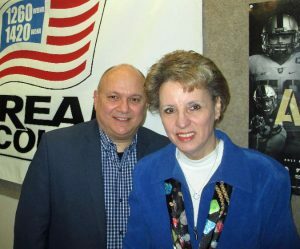 Dinner Theater in Dutchess Country (Aired on April 21 and 22, 2018) Felicia DiNonno, founder of the Clove Creek Dinner Theater in Fishk ill, NY, and Rotarian Andrew Ciccone (Newburgh) visit RadioRotary to tell about the many fundraising opportunities available using the facilities of the dinner theater. Of course, Clove Creek Dinner Theater features new comedy theater every month interspersed with audience-participation mysteries and other special evenings along with dinners prepared by Culinary Institute chefs. Nonprofit organizations can use the shows as fundraisers in several ways. Tickets can be purchased for an evening fundraiser at a reduced rate and then sold at the regular rate or higher, with the organization pocketing the difference. Clove Creek staff will help set up drawings or contests with prizes supplied by the dinner theater and organizations can run their own raffles or silent auctions, taking home all of the money earned. The dinner theater will also help promote the fundraising event on its popular Facebook page.